The 11th installment in the project Shrine Maiden series. Subterranean Animism is a straightforward shoot'em-up, except that the player controls a flying girl instead of the typical spacecraft. When enemies are shot down, they may drop various "items", such as Power Ups, Point items or other special items with various effects. The game consists of 6 stages, each stage having a mid-boss and an end-of-stage boss. In Subterranean Animism, the player can choose between playing the standard characters Reimu (shrine maiden) or Marisa (witch). Both have a choice of three different sub-characters, creating 6 combinations. A special feature of this game is that pressing "slow" and "fire" at the same time will activate a special ability. For example, Reimu (with Yukari) can use this to teleport from one extreme side of the screen to the other, whereas Marisa (with Patchouli) can change her shot type mid-game. 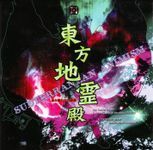 The backdrop story for Subterranean Animism is that Reimu and Marisa are diving underground to investigate the strange sounds coming therefrom. They encounter an underground world populated by various underground daemons. The player starts at (fire) power 1.00. Red enemies will drop Power Up items when shot. Collecting power up items raises the power by 0.05, (20 items will raise the power one level). For each level, the player's fire power visibly goes up, with more shots on screen. Extra lives are had by collecting five "star" items. Star items are dropped by mid-bosses and bosses, if the player defeats any boss attack pattern, whether Spell Card or not, without dying (bombing during the attack does not prevent the star item from dropping). Bosses in Project Shrine Maiden usually have several "attack patterns", following each other. The boss starts with the first, and if the player reduces the boss's health bar by a certain amount, the boss switches to the next attack pattern. A typical early stage boss can have about 6 attack patterns, with the final bosses closer to 20. Some attack patterns are called "Spell cards". These attack patterns are usually identified by a graphic effect upon starting, and they also have a name appearing on screen. Spell Card attacks will usually yield a special point bonus if defeated without dying or bombing. The games in project Shrine Maiden all have unique mechanisms for aiming at a high score. The common denominator is that all of them concern the Point Items that yields points when collected; usually more points the higher up on the screen they are collected, up to a certain maximum. Most games in the series have a unique system on how to increase this maximum, how actually gain the maximum when collecting the items, and how the player is point-wise penalized for dying and/or bombing. Like in all games since the Scarlet Devil (Shrine Maiden 6), flying high up on the screen (the top 3rd or so, above the so-called "Item Get Line") will automatically attract all items on screen, and will yield the "point maximum" for each point item. However, in this game, it's not so much a "point maximum" as a "base value" for the point items. The base value starts at 50,000 points. The points for each point item is the base value multiplied by a percentage, which at the start if the game has a minimum of 0% and a maximum of 100%. When the player flies above the Item Get Line, this percentage immediately jumps to its max value, and when the player drops below the Item Get Line, the percentage starts to fall, reaching its minimum after a couple of seconds. Dying during a Spell Card attack will miss you the Spell Card bonus. Also, and more painfully, dying will reset the base value for Point Items to 50,000 points. Dying often is hence worse point-wise than dying in bursts. Bombing during a Spell Card attack will miss you the Spell Card bonus. Bombing outside of a Spell Card attack (boss or not) does not induce any direct points penalty. However, it lowers the player's Power by one level, which has two indirect effect on points: Firstly, all penalties coming from reduced firepower (taking longer, not shooting down enemies as fast) secondly, red enemies will of course start dropping Power items instead of small green items. Compared to dying, however, and compared to previous games, the penalty for bombing (Spell Card or not) is next to completely negligible. Graze much when you can. At hard sections, you can sit at max percentage and collect everything on screen just by grazing (however, it's not worth it if you miss many items, so don't overdo it. Also, don't risk dying, because dying is BAD). Really, really don't die. Your base value is reset to 50,000, which is absolutely devastating. Weirdly enough, Stage 1 has a disproportionately large amount of green items. You'll see Item Max go up 12,000 points in just that stage, which is unheard of on any other stage. Apart from that, avoid bombing during Spell Cards.